We tend to react to stress or conflict with a deep-rooted negative pattern that includes avoidance, anger, denial and so on. The list of behaviours is endless. This tends to get in the way of effective communication, creating a distance between you and your partner. Following the steps detailed below will help you improve this. Be truthful. Be open to getting input from your partner. You have to be willing to test and be tested. You don't have to say ( and shouldn’t say) everything you're thinking, but everything you do speak about has to be true. If your partner asks you if you're upset, and you are, you have to be prepared to be truthful and say, "Yes." It's important that both partners know they are going to be told the truth. Clarify. After having that initial talk, clarify what YOU have understood from the content of that talk and the feeling you get from that input, for example, “I am sensing anger and resentment from you”. Accept feedback and respond, not react. If you are the one who is talking and if you feel that your partner has misunderstood the feeling that you are trying to convey, then clarify before moving any further. If you are receiving the input, respond only when you are clear on what you are responding to, the content, the feeling. Then accept the feedback given. Stay in the moment. Do not discuss past history at any time during this process. Stick to the present issues. Do not under any circumstances, leave. Do not leave the discussion until it is completed. To keep it from dragging on, you can agree on a time limit beforehand so that both of you know how long the conversation will last. 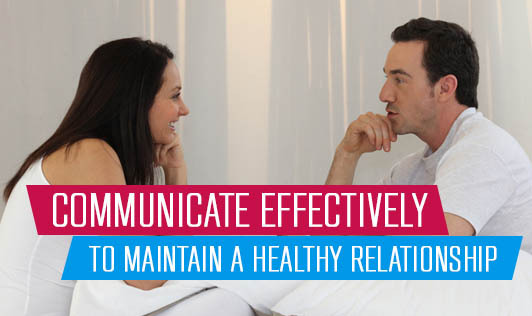 Practice these steps and over time these tips will help you communicate well in all your relationships!